HTET Study Notes for PGT English. (Last Updated : 03.12.2018) HTET PGT English Study Notes 2019 PGT English Syllabus are very helpful for the candidates who are going to participate in HTET Exam for PGT English. Candidates who are appearing in HTET 2018 can use these notes for HTET PGT English. These HTET Notes for PGT English includes HTET PGT English Practice Papers, Practice Sets, Previous Year Solved Question Papers of PGT English & Study Material as per HTET Syllabus of PGT English. Haryana Bard of School Education (HBSE/BSEH) conducts Haryana Teachers Eligibility Test for three levels - Level-I (Primary Teacher - class 1st to 5th), Level-2 (TGT - class 6th to 8th) & Level-3 (PGT - class 9th to 12th). The candidates who intend to become a teacher in Haryana at senior secondary level are required to pass HTET Exam for PGT level-3. To perform better in HTET PGT English exam, it is necessary for the candidates of PGT English to go through the Syllabus of HTET PGT English and make efforts in proper way. Syllabus of HTET PGT English - HTET PGT Syllabus is available on the official website of HTET i.e www.htetonline.com & www.htet.nic.in. Apart from compulsory parts - Part-I (Child Development & Pedagogy), Part-II (Language-I Hindi Grammar), Part-III (Language-II English Grammar) - Part-IV (Subject related) is very important which contains 60 Objective Type Multiple Choice Questions. This part includes study material of English Grammar, English Literature & Text Books' Lessons/works of English Subject. Here are some topics that can be included in the syllabus of HTET PGT English. We will provide here study material for the all three sections - English Grammar, English Literature & English Text Books for HTET PGT English. Here is the study notes on text books of English subject for HTET 2018-19. Note : This list will be updated on regular intervals. Other sections of this series of PGT English Study Notes for HTET will be posted soon. 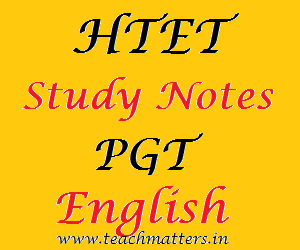 So visit this page regularly for HTET PGT English Notes.